My husband and I have taken up running. However, when we go on long runs, we get nervous that if something happened……we would have no ID on us. And sometimes we’re 10 or so miles away from home and people in that area wouldn’t recognize us. So I’ve come up with these ID bracelets. And really, you could make them for your kids too. If you’re at an amusement park and if they get separated from you, they would have some sort of ID on them. However, I would make sure that their name and info is mostly hidden from strangers walking by. (Maybe around their ankle, partially tucked into their sock.) You wouldn’t want some random person to see their name and then call them by name as if they know them. But it’s up to you. Here’s how I made them. I measured the size I would like them, then added an inch to each side (so it can overlap for the velcro). I cut a piece of 7/8 inch wide ribbon that length (you could also use fabric). Then I cut a piece of vinyl the same size. Then I printed our information out on the computer: name, address, and phone numbers. I slipped that piece of paper in between the vinyl and ribbon and then sewed some double folded bias tape. Make sure to purchase the very narrow kind so that it doesn’t cover up your information. Attach to your wrist or ankle and now you have some ID in case of emergency. **edited to add: If you are making one of these to be used for running, cut out 2 pieces of the vinyl, put the paper in between and then follow the instructions from above. If not, you may notice the paper/vinyl getting steamy from your own heat and perspiration. That's a great idea! I've been thinking about something like this. Now if only find a way to carry my phone while I'm running, I'd be all set. It am paranoid about leaving the kids with a babysitter and the babysitter not being able to reach me because I'm running. I'm paranoid like that too!!! Great idea! I have some ID tags that I bought when training for a marathon, for the same safety reasons. They are very similar, but they are for your shoe – imagine if you took your same design but put one piece of velcro on the other side, and folded it in half instead of making a bracelet. Then you just pass it through a shoelace and close it. A little less obvious than a bracelet, but I think it's still obvious enough to find if needed. I have been needing to make and/or buy a tag to put on my girls' diaper bag when they are at childcare and just have never gotten around to it. I think I'm going to make up a couple of these for my girls and when they are not wearing them as id bracelets, they can double as name labels for their diaper bags. Thanks so much for the great idea! Great idea, I'll have to add this to my list of to do's! Ooooh, attaching to a diaper bag for daycare is a great idea! And Beth, yours look great over there. Turning the info to the inside is perfect. Evelyn, I like the idea on the shoe. Then I'd never have to mess with it or feel it. Genius idea!!! Oh this would be great to add to 72 hour kits as well for each member of the family!! Great idea, I have a son with a deadly peanut allergy and this will be great for making him some more alert bracelets! Great idea! I was actually thinking of making one for my sons favorite stuffed animal (like pooh bear is to christopher robin) for our vacation this summer. I love the idea of having it for outdoor workouts, too! Great idea! I only go on 2km runs but still get paranoid that something might happen and I won't have ID with me. What A great idea!! I need to make one of these for my husband!! This is a great idea! I'm thinking of making one for my kiddo before we go to Disney World. I'm thinking I'll make it two sided, with the outside saying in large letters "If I get lost" and then have all our contact info (our cell phone numbers and names mainly) on the inside. So people would know where to look, but it wouldn't be easily seen by passers-by. I love how customizable this is, what a great idea. I'll be linking. 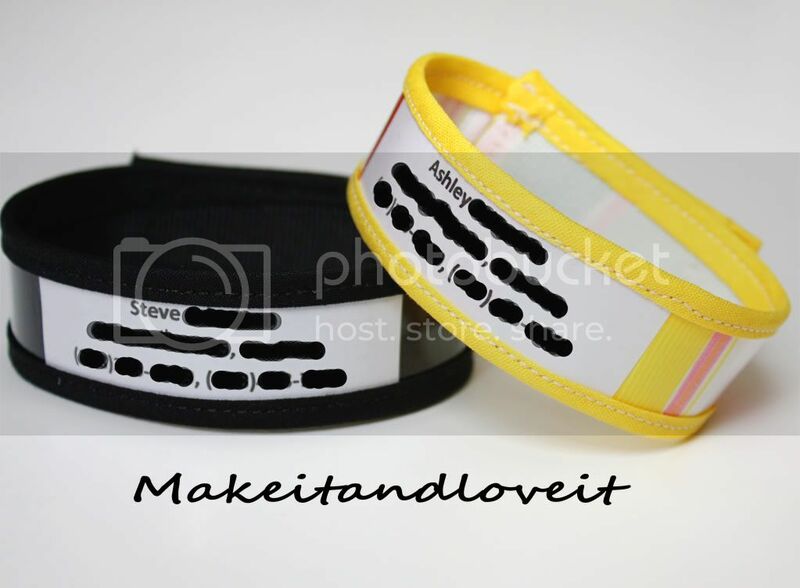 I didn't read through all the comments so I don't know if anyone else already said this but you could make one for kids that has double sided ribbon and put the information on the inside of the bracelet so it isn't as visible. I have a daughter with severe allergies and we have a hard time keeping her in an medical alert bracelet but I could easily make a ton of these and she could pick and choose to match her outfit! I am so glad I stumbled on this idea!!! Thanks! Great idea .. I am gonna try it for my son who has Autism …. as a just in case he wanders off id tag… but i am gonna try putting the info inside the bracelet some how. lol Thanks so so much you have wonderful idea i love reading all of them. This is on my list for this week… my baby has egg and peanut allergies and I need to do something to alert people about it.. thanks! that is on my husands Christmas list. Thanks! Thank you for this! We are going to disneyland next week so I have been searching for i.d. bracelets for my kids in case we get seperated, but i found nothing! I'm definately putting a few of these together tommorrow! This is fantastic! We are going to Disney World in a couple weeks and I too have been searching for a "cool" ID bracelet…nothing until now! I made my son a "Toy Story" one and he LOVES it! Thanks so much for sharing!! Thanks so much for the idea. I’m going to take someone else’s idea of putting the info on the inside for a child; and since I literally have no time, I’m going to try laminating this, instead of using vinyl. Thanks so much for sharing!